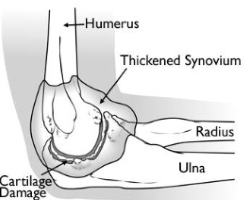 Rheumatoid arthritis: This disease causes the membrane around the elbow joint to thicken and become inflamed, ultimately causing severe cartilage loss. Osteoarthritis: Usually occurring in those over 50years of age, this joint disease causes the cartilage that acts as a cushion for the joint to wear away. The bones then rub against each other causing stiffness and pain. 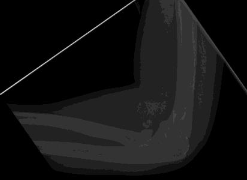 Post-traumatic arthritis: Following a serious elbow injury the surrounding tendons and ligaments may cause damage to the articular cartilage. 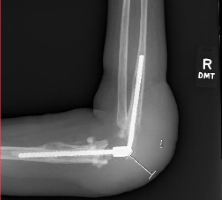 An elbow replacement consists of two metal stems that fit inside the humerus and ulna and are connected by a hinge. Patients will need to stay in the hospital 1-3 days after surgery. Physical therapy will begin 10-14 days post-operation. Infection: Open surgery will be used to determine the level of infectionand if it can be treated with antibiotics. 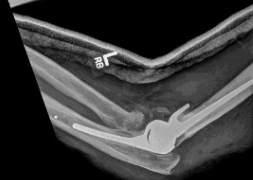 If the infection is severe the replacement will be removed and a temporary antibiotic spacer will be placed in the elbow to clear out the infection. After around 3 monthsthe spacer will be surgically taken out and a new, clean elbow replacement will be put in.